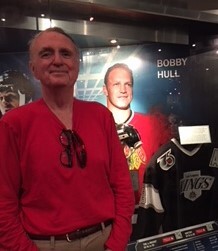 In front of the Bobby Hull exhibit in the Hockey Hall of Fame on Front and Yonge streets in Toronto. The “Golden Jet” inspired thousands of kids in Chicago to learn how to take a slap shot from anywhere on the flooded prairies [Chicagoese for vacant lots] and parks with mounds of snow for “nets.” Also paid homage to Stan Mikita, the center of the “Scooter Line;” Pierre Pilote, the defenseman who could shoot and gun with the best of the wingers; and Glenn Hall, the impeccable goalie of that 1961 Stanley Cup Blackhawk Team. All recognized as being among the greats. That magical season was the only time in the “Original Six” team era that Montreal, Toronto or Detroit did not win the cup. I wore that tee when the Capitals won their first cup — ever.